Everyone who has ever had to do any kind of painting job is aware of the effort such projects often mean: first one has to mask off other surfaces like furniture that aren’t supposed to covered in paint, then hard-to-reach spots need to be worked on first and last but not least walls and ceiling must be painted in a steady and uniform manner. 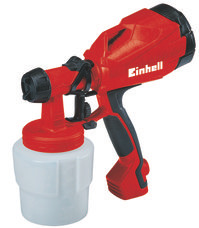 Using Einhell paint spray systems painting projects can be realized considerably faster and easier. 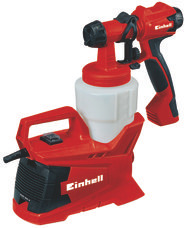 Especially working on near-ground or over-head areas will be facilitated by a paint spray gun. Moreover, even inaccessible nooks and crannies like those of very detailed furniture can be reached easily. However, a paint spraying gun not only a time-saving but also an economic acquisition as you will need to purchase less complimentary painting equipment and the required stowage space is smaller as well.